I do understand that the hotel just reopened and they indicated that there’s still some renovations going on, but I expected a lot more for a luxury hotel. Staff friendly and attentiveness wasn’t what I expected as well as their food menu is VERY limited. For the price paid I expected A LOT more out of this hotel. Beautiful Resort with Amazing Views, Fun,Friendly, Accommodating Exceptional Staff & A variety of tasty cuisine. My husband and I would definitely return. Thank you Sonesta Ocean Point! The rooms are beautiful. The staff have great upbeat attitudes. They welcome you and actually remember you throughout your stay. Turn down service is a nice surprise when you get back to your room. Love the chocolates left on the pillows. I was on the second floor room 307. If your an av geek I suggest getting a higher room to see the airplane touch ground. Or if you don't care about airplanes the swim out rooms are great to cool off in. In between two great beaches Maho and Mullet bay. Can walk to either with ease. This was Superbowl weekend and the hotel set up a huge projection screen on the beach. There was easy access to food and drinks. Tons of lounge chairs. I don't think I can ever watch the Superbowl any other way. This will be the only hotel I stay when I visit St. Maarten. We really enjoyed our extended long weekend stay at Sonesta Ocean Point. Having stayed at Sonesta Great Bay and briefly visited Sonesta Maho, I believe this is the gem of the three properties. The rooms and bathrooms are immaculate, housekeeping daily, decent toiletries, and furniture in good condition. The mini-bar is more than well-stocked with Nespresso machine, soft drinks, and top-shelf alcohol. We stayed on second floor and found that the airplanes are extremely loud (we figured this would be the case), but they do not leave too early nor land too late. The advertised "soundproof rooms" does not work for planes, but for other hotel noise, we found the soundproofing great. Luckily, as this is a 5* resort, I asked guest services for help; we received more pillows (the staff even asked if we wanted them more firm or soft), a fan that blocked out the plane noise, and to make smaller change for tips. The staff are all very friendly, accommodating, and make you feel welcome. We were a little frustrated with the choice of restaurants as Azul is absolutely lovely, but you most likely don't want every meal there for dress-code, heavy food reasons. The Palm Grill was always booked up- we really wish we had booked way ahead. The grounds are really well-kept, the pools are clean, bar/patio service is great. The atmosphere is more relaxed than Great Bay (GB has way more of a party vibe), but not stuffy. I would absolutely stay here again and recommend it to friends. Beautiful property. Looking for the island resort getaway this is it. Very relaxing. I love airplanes so this was a special treat to book this hotel. Watch airplanes and relax.May only Complaint is that I felt the bed was hard and uncomfortable along with the sheets. The Sonesta Ocean Point was marvelous! The staff, especially at the Azul restaurant were super accommodating and friendly. I would highly recommend a swim-out suite, especially if you can get one on the swim-out pool side near the Azul. The views are completely unobstructed. This resort also has premium liquor included, which we did not know when booking! Amazing resort. Rooms were fine but overall area was run down. Food was terrible and service was just ok.
My husband and I stayed here for our honeymoon. We truly enjoyed that it was a high end all-inclusive meaning that we had top shelf liquor with all of the lobster and steak we could eat. Our favorite restaurant was Azul. We ate there quite often. We covered breakfast, lunch and dinner. The room was spacious and had a great shower. The bed was a bit uncomfortable. It was a little annoying that the bed wasn't connected to the headboard and it would roll. Some other downsides to the stay were that there was an abnormal amount of cats that wandered the property including inside the restaurants. The place also seems to still be under construction in certain areas and one of the elevators lacked air condition, which was very much so needed in the heat. Overall, we enjoyed our stay. The staff was very helpful, especially the dining staff, which one young lady went able and beyond to make our dinner romantic one night, but using her phone to play music for us. The location is great. Very modern comfortable rooms, nice pools. Cleaning - twice per day.The Restaurant on the cliff is fantastic - table service by menu for breakfast, lunch , dinner. Unforgettable observation of landing plains, which are not flying at night or in the morning. I have habit to forget things - my favorite cap was returned me by beach worker next day , mask&snorkel was returned by a gardener, who even able to find/ follow me in the terrace restaurant in ten 10 min after i left my beach terrace chair. The beach is shared with Maxo hotel - not only adult , next to Ocean point - and is not big . I went to Mallet bay beach - 10 min walking distance - which is fantastic cove for safe long swims, snorkeling . Also for middle and beginner tennis players they can provide activity staff person to play with, what is very nice. Casino next to hotel . The resort was quiet, clean and had great food. The Azul restaurant which requires reservations had great food and overlooked the water. The location is great as well. It's next to the airport which I would have thought of as a negative but it was really cool to watch the planes come in right over the beach. It's also right next to the casino and some really fun restaurants/bars! Highly recommend. This was a very nice resort, the key wrist band was a great feature, wifi was adequate, service was above average, waiters & waitresses were very attentive, especially at Azul. The ladies at Azul provided by far the best service I've ever had at a resort restaurant. The buffet style food was delicious, breakfast, lunch & dinner varieties were amazing. One negative aspect was the room service, room service menu was subpar & room service employees were lacking in the hospitality dept. The airport was literally 2min from the resort which made the planes landing & taking an enjoyable attraction. All in all I give Sonesta a 4 out of 5. Very nice andcomfortable. Loved the pool area, made up for lack of beach. Molton Brown products were a plus! Hotel was great. They need to add entertainment at night and have the Palm restaurant open for dinner, they also need to up grade the buffet it was subpar, They should look at other hotels like the Rui for this. This was our first time in St Maartin. The hotel facilities was very clean, modern and well kept. The staff was very friendly and willing to go the extra mile to improve your stay at the hotel. Adult only was a plus as the Maho hotel which was close by was crowded and noisy. guest from the ocean point are able to visit the restaurant on the maho property however the premium hotel and on the ocean point hotel is amazing.. the hotel is very private and romantic plus the private walk in pool attach to the rooms were amazing..overall it was amazing my only issues was that they need a night club for younger couples who dont gamble..
Sonesta Ocean Point All Inclusive Resort places you next to Maho Beach and within a mile (2 km) of other popular attractions like American University of the Caribbean. This 5-star property has 129 rooms and welcomes guests with a restaurant, a casino, and a health club. This property serves as home to a restaurant, which has ocean views and specializes in Mediterranean cuisine, along with a cocktail bar. Order from 24-hour room service to satisfy your hunger without leaving your room. Beds are dressed in premium bedding and pillow menus, and the bathroom offers a hair dryer and designer toiletries. Other standard amenities include free minibar items, an iPod dock, and an espresso maker. Renovated in 2018, Sonesta Ocean Point All Inclusive Resort offers a casino, a health club, and a steam room. Onsite parking is offered for a fee. Helpful staff can provide dry cleaning/laundry services, tour or ticket assistance, and a safe deposit box at the front desk. Other amenities at this all-inclusive property include free WiFi in public areas, a conference center, and coffee/tea in a common area. 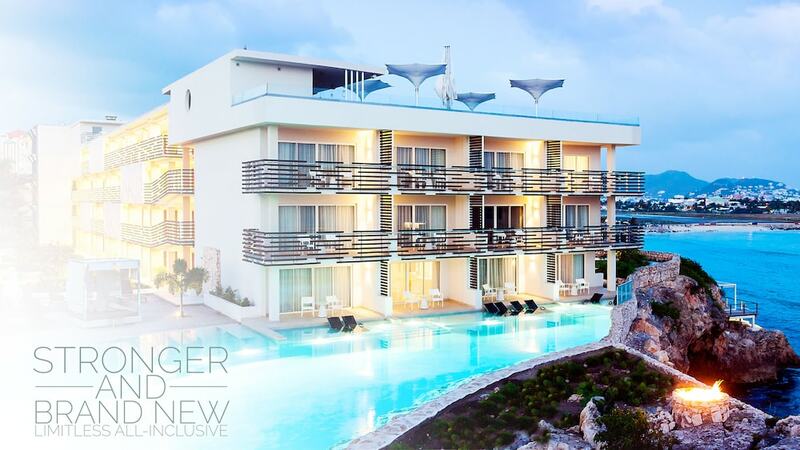 Thank you for the review and photos and for choosing to staying with us in St. Maarten. Thank you for choosing our resort and we also appreciate your feedback provided in this review. Thank you for choosing our resort and sharing your review. Thank you for choosing Sonesta Resorts St. Maarten and for writing a review. We appreciate the feedback and are always curious as to possible areas of improvements. Thank you for the review and for sharing your Superbowl Holiday with us in SXM! fantastic stay at sonesta ocean point!!! Thank you for choosing our beautiful resort as the place of your vacation and sharing your experience. We are glad that you enjoyed your stay with us and look forward to serving you at our beautiful resort once again. Thank you for the review and the feedback. Also thank you for recommending to other readers. Azul Restaurant - Ocean-view restaurant and bar specializing in Mediterranean cuisine. Open daily for breakfast, lunch, and dinner. Alfresco dining available (weather permitting). Sunset Lounge and Bar - Ocean-view cocktail bar open daily. Martins Bar - Bar. Open daily. Azul Roof Top Tapas - Ocean-view restaurant and bar specializing in Caribbean cuisine. Open daily for lunch and dinner. Alfresco dining available (weather permitting). Recreation features at Sonesta Ocean Point All Inclusive Resort include a health club and a steam room. The preferred airport is Philipsburg (SXM-Princess Juliana Intl.). Check-in for this property is based at a different location, check-in kiosk at the Sonesta Maho Beach Resort entrance. Reservations need to be made in advance for massage services. Contact the property at the phone number listed on your booking confirmation. A charge for a mandatory Christmas Day gala dinner on 25 December is included in the total price shown.